Led by a game-high 24 points from junior Kendall Francis, the Mount Saint Mary College Men’s Basketball team cruised to a 71-42 Skyline Conference win over Maritime. NEWBURGH – Led by a game-high 24 points from junior Kendall Francis, the Mount Saint Mary College Men’s Basketball team cruised to a 71-42 Skyline Conference win over Maritime on Saturday and in the process clinched a berth in the upcoming Skyline Conference Championship. Mount Saint Mary trailed only briefly on Saturday, falling behind 3-2 on an Alec Downes triple just 30 seconds into the contest. From there, the Mount got an Ethan Fox lay-in to move in front for good in the game. The bucket started a 14-5 stretch that saw the Knights move in front 16-8 following a pair of Connor Bacci free-throws at the midway point of the half. The Mount’s lead grew to double-figures for the first time on a Jameson Morton lay-in that pushed the Mount in front 20-10 and ballooned to a half-high 15 points on a Jaiden Melendez jumper in the final half minute of the half that sent the Knights to the intermission with a 32-17 advantage. 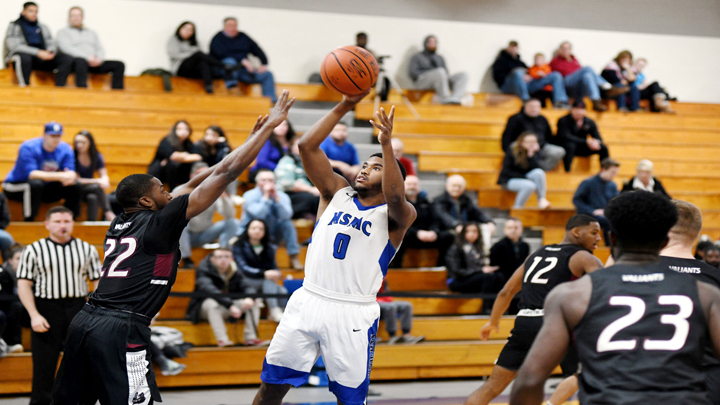 Although the Mount shot just 39.1-percent in the first half and did not make a three-pointer, the defense limited Maritime to a conversion rate of just 22.7-percent and forced 15 turnovers. Francis led all scorers at the break with nine points on the strength of a 7-for-8 effort from the charity stripe. Coming out of the break, the Privateers whittled their deficit down to 12 points on a Husene Camera bucket, before a Francis three-pointer started a 31-5 run covering nearly nine minutes to put the game away. Maritime was 1-for-11 from the floor over the run, while the Mount was 12-for-15 from the floor, including 3-for-5 from behind the arc. Francis and Bacci combined for 24 of the 31 points over the run for the Knights. After a Tristan Millett free-throw pushed the advantage to a game-high 38 points with 8:50 left in the contest, the Mount’s lead did not fall under 29 points the rest of the way. Mount Saint Mary improved to just over 48-percent shooting in the second half and kept the defensive pressure up, holding the visitors to under 27-percent after halftime. Francis scored 15 points after the break, connecting on a trio of three-pointers. Francis reached the 20-point plateau in a game for the 10th time this season after going 7-for-12 from the floor with three triples and his 7-for-8 effort from the free-throw line. He added seven rebounds, two assists and a pair of steals to the winning effort. Bacci contributed 15 points in the win, with 12 coming after halftime, going 5-for-9 from the floor. He joined Francis with a team-high seven rebounds and led the Mount along with Paul Sienke with four assists. Fox chipped in with seven points and Millett led the way with three steals. Maritime was led by eight points from Brendan McGovern and received seven rebounds from Camara. Ronan Doherty led the team with three assists off the bench. Mount Saint Mary finished the game shooting 44.4-percent overall and held Maritime to a 25-percent effort. The Knights dominated the paint, with a 38-12 advantage in scoring inside, and turned 23 Maritime turnovers into 27 points. Saturday’s win pushes Mount Saint Mary to 13-9 overall and 10-7 in Skyline Conference play heading into the final week of the regular season.